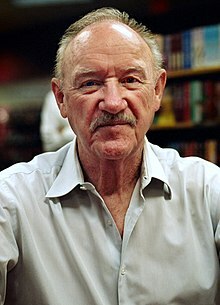 Eugene Alden Hackman (born January 30, 1930) is an American retired actor and novelist. Hackman was born in San Bernardino, California. His parents divorced while he was a child, and he moved from one place to another until he settled finally in Danville, Illinois, where he lived with his English-born grandmother. At the age of 16 he left home to join the Marines, where he served 3 years as a radio operator. Having finished his service, he moved to New York, where he worked in several minor jobs. He then studied television production and journalism at the University of Illinois. Already over 30 years old, Hackman decided to become an actor, and joined the Pasadena Playhouse in California. It was in that school that Hackman became friends with another person who wanted to be an actor named Dustin Hoffman. After working hard in many roles he became a well-respected actor. He has won two Academy Awards, and has played many well-known roles. This page was last changed on 8 April 2019, at 23:19.